We are a family-run oyster farm. 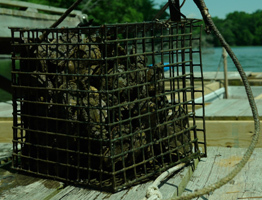 Chapel Creek Oysters are grown in the sheltered habitat of the Piankatank River in sight of the Chesapeake Bay. Come to Mathews and see the farm and explore this ecosystem. We are members of the East Coast Shellfish Growers Association, Virginia Shellfish Growers Association and are in a partnership with Sensible Seafood through the VA aquarium. Chapel Creek also offers a variety of tours to suit your desires. Browse our site, call 804-815-6132 or email us for more. Does your establishment crave the most mouth-watering oysters out there? We've got 'em. Our region offers tons of options for fun. Want to surf? Want to SUP? We're your ticket. Oysters? Surfing? SUP? We've got good things going here. Here's where we keep you posted.